Class Summary: What time is it? Slime time! That’s right; this course is all about the gooey green glob of fun, better known as slime. 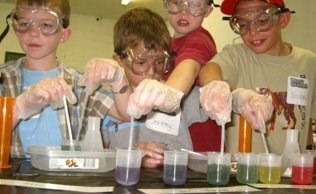 This course teaches children about the ingredients needed to make a good ‘ol batch of slime. With the help of instructors, students will get to whip up several different slime recipes. At the end of the class, students will get to use their slime creations in a series of fun games and activities known as the Slime Olympics! Educational Value: Just like many other recipes, the property of slime changes based on the amounts of ingredients used. 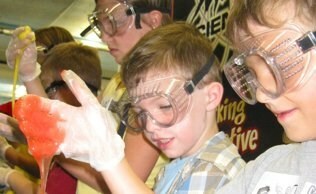 Students will learn all about mixing polymers and cross-linked polymers to make an ooey gooey batch of slime.